If someone told you that you had a 1-in-8 chance of winning a million dollars, you’d feel like you had a pretty good shot at it. If you had a 1-in-8 chance of being struck by lightning, you’d probably stay indoors when it rained. For some things, a 1-in-8 chance can seem like a near certainty. But if you knew you had a 1-in-8 chance of being diagnosed with a potentially deadly disease like breast cancer, would you be concerned? Would you do anything to try to prevent it? Would you schedule mammograms on a regular basis? I became a member of the 1-in-8 Club in 2006 when I received the news that I had breast cancer. My immediate reaction wasn’t sadness or confusion or anger – those came a little later. At first, I had an overwhelming sense that I was alone, despite having an amazing spouse and children. Feeling alone is a little different from feeling sad or confused or angry. Receiving my diagnosis was a bit like standing by myself on the moon – nobody else could truly appreciate the vast, black emptiness surrounding me. Even though my family, friends and colleagues were incredibly supportive, I felt like no one could understand what I was feeling. To me, that is the definition of loneliness. I want to try to make sure no other woman ever feels like that when battling breast cancer. Because although I felt all alone, I definitely was not. It’s true that nobody could take my place during the treatments and physically share the cancer, but many people were eager to help bear some of the emotional burden with me. When my confidence was lacking, my friends lent me some of theirs. When the treatments wiped me out physically, my family gave me time to rest while they kept our household running smoothly. And when I went to my first Triangle Race for the Cure in Raleigh, it suddenly occurred to me that I was one of thousands of women affected by the disease – I definitely was not alone. 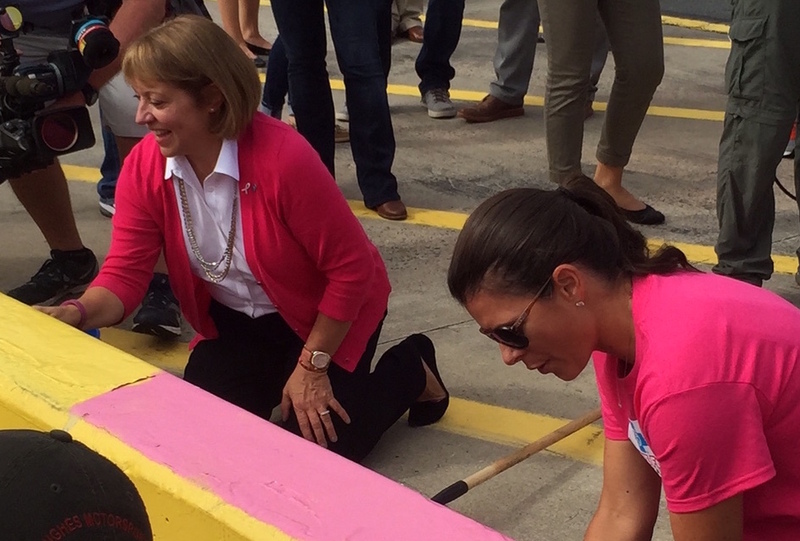 Painting the wall pink with Mia Hamm at Charlotte Motor speedway. October is National Breast Cancer Awareness Month and Blue Cross and Blue Shield of North Carolina is using that awareness effort as the starting point for a broader dialogue about women’s health – and the need for women to feel empowered to face health challenges with confidence, hope and a sense of dignity. But the focus shouldn’t rest solely on getting well when we’re sick – women also need to be concerned with being well, doing what we can do prevent illness. That means making time to think about our own health, which for many women does not come naturally. A lot of us spend so much of our energy making sure others are OK that we neglect our own welfare. This is particularly true of mothers, who very often fill the role of household triage nurse, monitoring the entire family’s health – but not their own. I know what you’re thinking: “That sounds like a good idea for people who aren’t as busy as I am. I wish I had time for me, but I don’t.” And believe me, I said those exact words! As a cancer survivor, I’m telling you your life may depend on finding the time for you. Ladies, think of seven of your female friends or relatives. The odds say one of you will get breast cancer, if that hasn’t happened already. But my message isn’t one of doom, it’s one of hope. Women don’t have to face difficult health challenges alone. 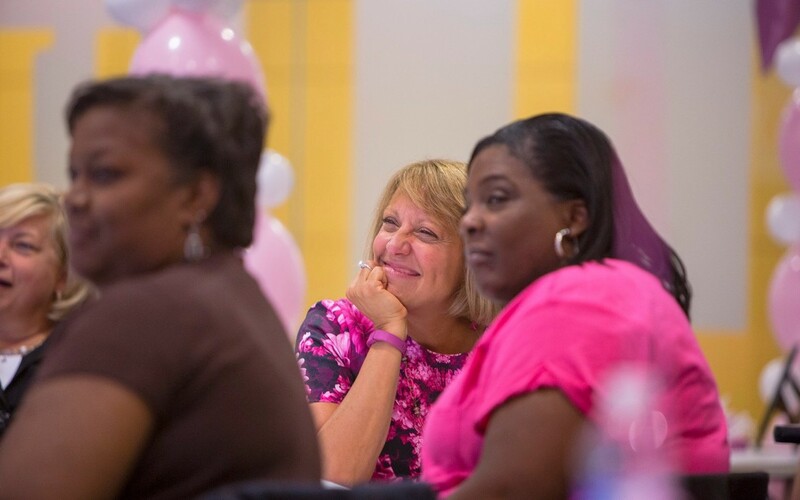 If you are dealing with breast cancer, there is a community of support in North Carolina that wants to help you. You can speak to other women who are fighting the same battle or to survivors who understand exactly what you’re feeling. There are online resources that can help you monitor your health and adopt a more active lifestyle to ward off chronic health problems. For more personal assistance, Blue Cross and Blue Shield of North Carolina offers case management services to members dealing with serious or complex health problems, registered nurses who check-in with patients by phone to answer questions, offer guidance on insurance issues – and sometimes just to be a sympathetic ear. Remember: 1 in 8. My number came up. If the same happens to you, you’re not alone. Fara Palumbo is the Chief People Officer at Blue Cross NC, ensuring that the company’s more than 4,700 employees are equipped to support and achieve strategic business goals.